Indiana Jones and the Kingdom of the Crystal Skull is the fourth installment in the series. This contrived failure limps by with a 6. 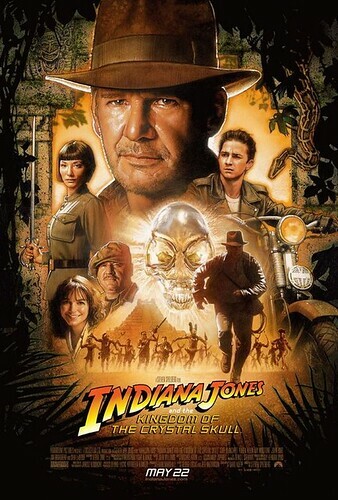 Indiana Jones tracks down a Crystal Skull and the mythic temple in the Amazon from which it originated while battling the ruthless KGB agent (Cate Blanchett) who is also seeking it and its fabled powers. Don’t blame Harrison Ford for this being the worst of the four movies. He plays Indiana Jones well and keeps him in character. It’s not easy being such a stud when you’re 66 years old. Indy has an amazing punch and huge capacity to take damage for such an old guy, but he plays the character as an older man for the most part. His acting and character kept me sane and in my seat. This movie almost sunk to a 5 as I almost considered considering leaving. Cate Blanchett did a decent job as Irina Spalko in her mad quest to get the skull and its purported powers. She was a pretty good bad guy but lacked the ruthless evil that the antagonists in the other three movies possessed. None of the bad guys in this movie were driven by the joy of hurting others like in the other movies. They were bad, but not evil. It was nice to see Karen Allen again. She was good reprising her role as Marion Ravenwood and seemed to relish it. Shia LaBeouf (Transformers, Disturbia, I Robot) was also pretty good as Mutt Williams and in his function as a draw for the younger movie crowd. It has been 17 years since the last Indiana Jones. So why am I so unhappy? The movie seemed to be contrived. It seemed that they tried to jam too many references or gimmicks from the other movies into this one but did it poorly and superficially. Jones is sinking in quick sand and all they can find in the jungle to pull him out is a great big snake? No sticks or vines nearby? It wasn’t funny at all. Then there were several things that were just totally outrageous with no possibility of being believed: refrigerator, monkeys, jeep in tree, waterfalls, etc. Yes, this is supposed to push the limits, but some things are just too ridiculous to believe or enjoy. When two dozen trained KGB soldiers are firing at Indy with automatic weapons at short range, how can every single one of them completely miss him? Spielberg could have used fewer soldiers or had them start shooting when Indy was further away or had some cover. But no, why bother having any sense of reality? In so many cases, they made it so hard to believe in the movie when it was so unnecessary to make it like that. When they are actually exploring the various tombs and crypts, the movie glides back to its roots and is believable. I liked the plot. It was the execution and script that sunk it. One category that I really enjoyed was that the movie used special effects similar to those from the 1980s. It kept the feel of the movie in line with the first three. It was a good nostalgic effect. I love the Indiana Jones movies and walked into the theater wanting to enjoy the movie. But from the first scenes, it just made me angry and disappointed. Thanks for the review, E. As always, very nicely done. Unfortunately, your views are consistent with everything else I’ve heard about this movie….I had really hoped that it would be good. Ah well, we can’t go back, can we.